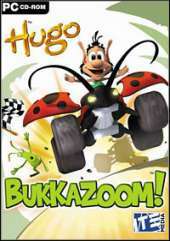 This is a 3D racing game based starring Hugo the TV Troll, a popular cartoon character on Danish television. In this game Hugo is shrunk to the size of little green creatures called greenflies. He must race a kart through marshes, deserts and various landscapes. The circuits have checkpoints, upgrades and a scoring system open to different possible strategies. Both single-player and multiplayer games for up to two players are supported. Included game modes are balloon race, greenflies in basket, regular races, capture the balloon, taxi race, free roam and time trial. There are different characters to choose from and they can use power-ups during the races, such as a shield, a cluster bomb or a turbo.